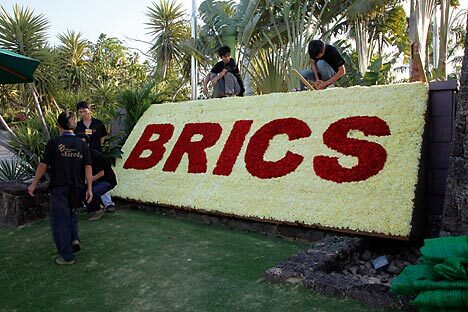 Russian experts believe political cooperation between the BRICS will continue to grow with the countries gradually drifting towards the development of a mechanism of coordination primarily in politics. The Russian media has recently published the report “Russia in the BRICS group. Strategic goals and the ways to attain them.” The Russian National Committee on BRICS Studies has drafted the report. First Deputy Chairman of the State Duma Committee on International Affairs Vyacheslav Nikonov heads the committee. According to available information, this report will lay the groundwork for a governmental comprehensive program over the use of Russia’s participation in the BRICS group to accelerate economic development and build up international and political positions of the country. The authors of the document elaborated on the idea that there cannot be a common centre of influence in the modern world. Russian Foreign Minister Sergei Lavrov dwelt on this idea in his article for the international digest “BRICS – India–2012”. “The union of the countries with a population of about three billion people can hardly play the role of “a bridge” or “a mediator” between “the North” and “the South”... This approach would have certainly limited the BRICS capabilities to pursue an independent policy on the international scene. The BRICS group is a global forum, which will continue to set the vector of global development in the twenty-first century to a larger extent,” Lavrov noted. Dean of the World Economy and World Politics Department at the Higher School of Economics Sergei Karaganov agreed with this supposition of the authors of the report. Karaganov is the only Russian citizen, who is put on the list of top 100 world intellectuals by the US magazine Foreign Policy and the British magazine The Prospect. “The West in a deep systemic crisis, which is related with European integration, a growing competition by new rapidly developing economies and a tangible decline in the life level,” Karaganov said. “At some time in the future, in 7-8 years in order to build up its weakening positions the West will be able to form a new economic union and to create a new free trade zone. But in the near future no leadership is expected from Europe or the United States,” he remarked. So, who can take up an initiative to improve the world order? The authors of the report reaffirmed that this is the BRICS states that can “offer a historical alternative to the world and assume (in cooperation with the West or without it, if the latter does not show the political willpower) the construction of the main frameworks of a new world order.” For this purpose the BRICS states, contrary to the West, have several strong positions. China shows a high economic growth rate, Brazil is rich with agricultural products, Russia is the largest world exporter of the hydrocarbons, India has sweeping intellectual resources, South Africa has abundant natural resources. The experts noted that after the death of Venezuelan leader Hugo Chavez Brazil will turn in a powerful leader in Latin America. But the resource potential of the BRICS states has not created a common platform in this union to settle topical tasks of the humankind yet. “The main problems, which the world is facing and which the world should settle, are the ageing of the world population, climatic hazards and the reduction of the fresh water resources, along with the instability in a large Middle Eastern region,” Karaganov pointed out. “The BRICS states can make some contribution in the settlement of these problems, but I do not see a common strategy among them, they did not establish cooperation on these global issues. I will recall that these countries in particular along with the United States were attempting to foil the Kyoto Protocol within the framework of the UN convention on the reductions of greenhouse gas emissions,” Karaganov noted. What kind of function the experts give to the BRICS states, if not the settlement of global tasks for the survival of the humanity? The report noted that it is profitable for Moscow to build up the political weight of the union. The maximum task is to transfer from the US hegemony to “a polycentric world order”, in which it will be impermissible to interfere in the domestic affairs of other countries in order to topple unsuitable authorities. In the economic sphere Russia and its partners should seek to reform “an outdated currency and financial architecture” and “to establish a more democratic and fairer international economic regime,” the authors of the report believe. The main obstacle on the way of turning the BRICS group in a full-fledged union is the lack of a coordinating centre. The authors of the report and authoritative political expert Karaganov have major differences in their positions on this issue. The authors of the report find it necessary to form a BRICS permanent secretariat and a bank of development with the charter capital of 50 billion dollars and a head office in Moscow, a bank of international financial transactions between the BRICS states and a special anti-crisis fund of 240 billion dollars. The authors of the report also find the West as a hurdle on the way of forming coordinating structures, as the Western countries will put a spoke in the wheels of the process to strengthen the union, which is their rival. Meanwhile, “no member-country of the union comes out against the West in the obvious way. They call for the strengthening of the union as compared with the West, their former rivals or rulers. The BRICS group is not an anti-Western organization, absolutely not at all,” Sergei Karaganov underlined.